This article assumes you are using Syncrify client on a Windows machine. The same principles apply on Linux/UNIX and Mac OSX. 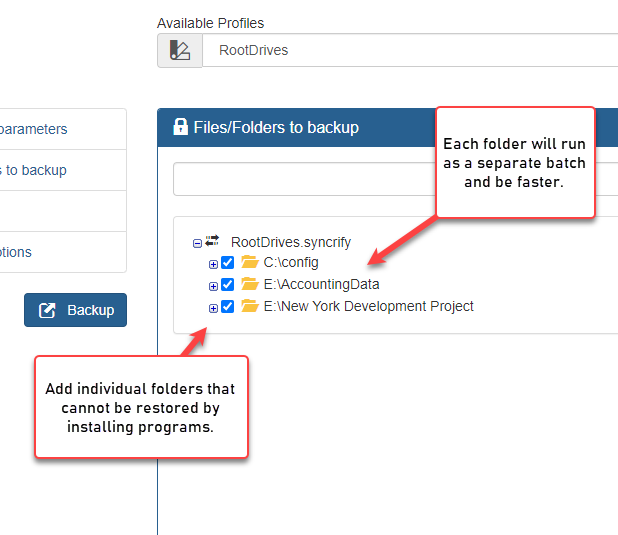 Keep in mind that a backup is only valuable if you can restore it. If your machine crashes and you need to recover files, restoring files belonging to the operating system does not make any sense. By simply copying the entire Windows folder won't restore your machine. Similarly, by restoring files in your Program Files folder won't install your programs on a new machine. Most programs will only run if you install them correctly. Every top level folder you add in Syncrify client runs in a batch. Therefore, when you add a root drive, the entire drive runs as one big batch, which is a lot slower than running several smaller batches. 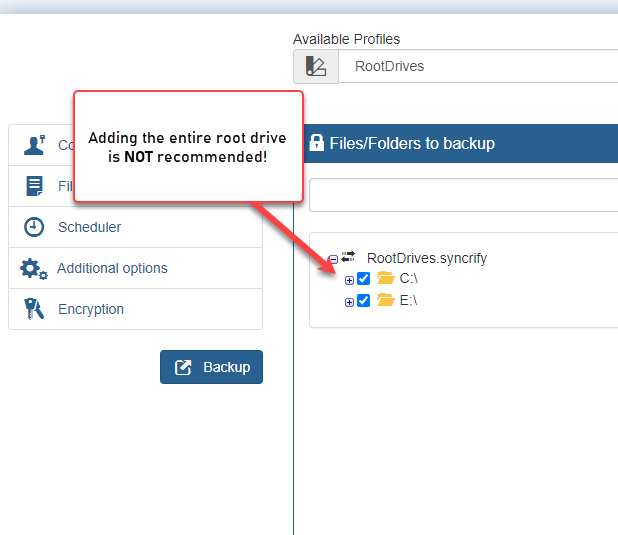 Instead of adding a root drive, add individual folders that you want to backup. One exception to this rule occurs when you have an entire hard disk dedicated for data. For example H: Drive that is used to store user documents. so if I backup an entire working computer then I put in a new hard drive and restore it your saying it wont work? so I guess I should use windows image and if the computer dies use that to get the new one up and running then use syncrify for the other files?